In 1934 the Nazis stopped using the name Prussia for that area, and in 1947 the Allies abolished the state of Prussia, and divided its territory among themselves and the new States of Germany. Today the name is only for historical, geographical, or cultural use. In the early 19th century, the liberals in Germany wanted one federal, democratic Germany. The conservatives wanted Germany as a group of independent, weak states[source?]. In 1848 revolution came to Europe – the liberals had a chance. Frederick William IV was worried. He allowed a National Assembly and a constitution. The new Frankfurt Parliament wanted to give Frederick William the crown of all Germany, but he did not want it. He said that revolutionaries could not name kings. Now Prussia had a semi-democratic constitution, but really the nobility with land (the Junkers) had the power, especially in the east. This was Prussia’s high moment. The economic and political future looked good, if the leaders were clever. But after 99 days, in 1888 the state had a new leader, William II. He fired Bismarck, who lost his job in 1890, and William II started a new foreign policy. He made the army bigger, and the navy much bigger, and took risks; this took Germany into World War I. With defeat, the Prussian Junkers lost power. The Prussian king and the other German kings had to leave. Germany became the Weimar Republic. In 1919 the Treaty of Versailles re-created the Polish state, and Prussia had to give up much of Prussia. The Polish Corridor was split between East Prussia and Germany. At the end of World War I, the Treaty of Versailles took away West Prussia to make the Free City of Danzig and Polish Corridor. Some people also wanted to break Prussia into smaller states, but tradition won. 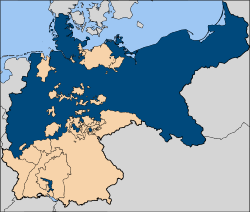 Prussia became the "Prussian Free State" (Freistaat Preußen), the largest state of the Weimar Republic, with 60% of its land. The industrial Ruhr area was in Prussia, and also Berlin, so Prussia was the home of the left. The Social Democrats and the Catholic Centre had power for most of the 1920s. The idea of Prussia is not completely dead in Germany. Some people want to put together the states of Brandenburg, Mecklenburg-Vorpommern and Berlin and call them Prussia. But German politicians are not interested in the idea.[source?] The constitution of Berlin allows for Berlin and Brandenburg becoming one state, but the people of Berlin voted against the idea on May 5, 1996. "Cartographica Neerlandica Background for Ortelius Map No. 56". orteliusmaps.com. Retrieved 16 April 2010. "Le Miror du Monde, Seite 70". uni-mannheim.de. Retrieved 16 April 2010. This page was last changed on 18 September 2018, at 00:17.